The Samsung Galaxy J7 V is equipped with a 5.5-inch, 2.5D rounded glass display with a resolution of 720 x 1280 (HD). Powering the device is a Snapdragon 625 chipset with an octa-core 2.2GHz CPU and the Adreno 506 GPU. 2GB of RAM is inside, along with 16GB of native storage. A removable 3300mAh battery keeps the lights on, and Quick Charge 3.0 is included. The rear camera weighs in at 8MP, while a 5MP front-facing camera handles selfies and video chats. 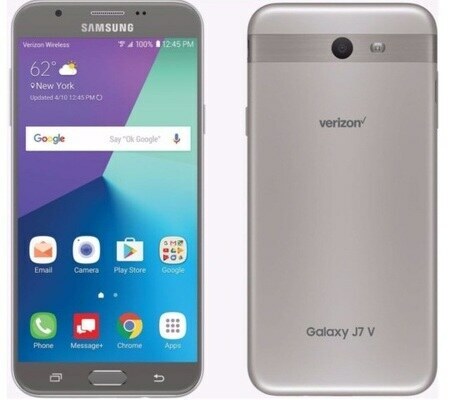 See the Samsung Galaxy J7 V Specifications, Features & Price below. We have introduced on screen currency converter for our visitors and this is one and only website with this feature. This will ease you to convert price in USD to your local currency at once, in this way you will not have to ask someone for price in your country. If you liked this feature share our website with your friends.